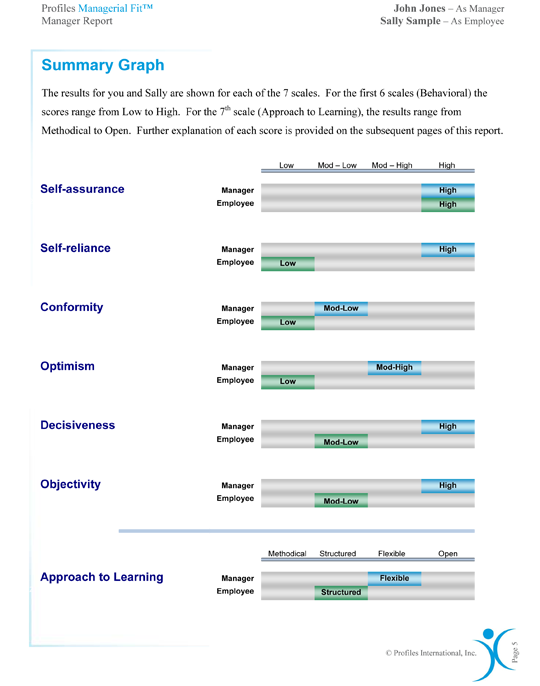 The PROFILES MANAGERIAL FIT™ measures critical aspects of compatibility between a manager and their employees. PROFILES MANAGERIAL FIT™ is a manager assessment test which measures critical workplace compatibility factors between managers (executive, director, supervisor, team leader, etc.) and their employee(s) to determine managerial fit. Understanding the dynamics of the supervisor-subordinate relationship helps the manager work more effectively with each employee by recognizing where their perspectives are similar and where they differ. With this increased understanding, managers can easily identify areas they need to develop, go through appropriate manager training, and strive towards becoming a competent manager. The PROFILES MANAGERIAL FIT™ is used to provide insight into specific managerial compatibility between managers and their direct reports. It also provides specific steps to increase manager and employee productivity to endorse better workplace compatibility. Useful to the manager or organizational leaders. Presents management fit with existing or prospective employees.